The other day I was puttering around seeing what there was to see. In the back of my mind I had ideas of finding something productive to do with my time and sec status. I had wandered afk, my attention span resembling that of a gnat. I wandered back and remembered that I was trying to be productive. There was only one other person in system with me. I was in a deep safe and scanned a few times. 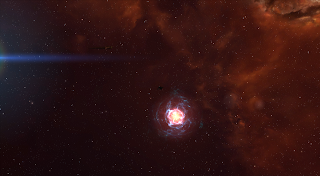 I was about to reposition myself when I noticed that there was a cyno beacon in my overview. Oh... hmm... I went to see. "Cyno Up," I told my corp mates as I warped to see what there was to see. With one ship in system, it had to be the cyno pilot and me. So I was brave and warped to zero. A Tristan sat upon the cyno. It was so tiny and brave looking, frozen in place. It was right off of a station but the chances of making it through an entire cycle are hit or miss. I stared at him for a bit. I had no desire to shoot him. I've sat atop my share of cynos, protecting my corpies from people. I know cyno alts are considered disposable. If not, there is often a fleet sitting on top of it to defend it. Yet, there is sat, alone. And it was very sad for some reason. The pilot finally asked me, "Don't you want to shoot me?" "No." I said with raw honesty. "No, I don't." "Oh." The cyno went down and he docked. "Thanks." "No problem." I warped off. Sometimes a little bit of mercy to someone from the experience of walking a mile in those shoes ourself can go a long way. Often such little favors are repaid tenfold when least expected.